U.S. stock futures for Monday, April 13, forecast a 31-point decline from Friday's close. Investors are looking forward to a very busy week of earnings reports, as concerns over a stronger dollar could weigh on corporate profits. Meanwhile, a number of geopolitical concerns could affect stocks and oil prices. It's a very busy week of earnings reports, particularly in the financial sector. Look for reports from JPMorgan Chase (NYSE: JPM) on Tuesday and Bank of America Corp. (NYSE: BAC) on Wednesday. Citigroup Inc. (NYSE: C) and Goldman Sachs Group (NYSE: GS) will report on Thursday morning. Financials might be the only sector with strong momentum heading into this week. According to Reuters, profits of S&P 500 companies are expected to fall by an average of 2.9% compared to Q1 2014. Oil Prices Today: Oil prices were moving up this morning on news that U.S. energy producers are slowing the pace of drilling across the country. This comes just days after Saudi Arabia announced it had reached record production levels despite falling prices. Brent oil gained 0.9% this morning to hit $58.40 per barrel. WTI crude gained more than 1.3% to hit $50.61 per barrel. Pre-Market Movers 1, SHLD: Shares of Sears Holding Corp. (Nasdaq: SHLD) were up more than 2% this morning on news it signed a 50-50 joint venture with Simon Property Group (NYSE: SPG). The deal will allow the retail giant to unlock the value of its real estate by placing at least 10 properties into the venture. Pre-Market Movers 2, QCOM: Shares of Qualcomm Inc. (Nasdaq: QCOM) jumped nearly 5% this morning on news activist hedge fund Jana Partners is pushing the company to spin-off its chip manufacturing division from its patent-licensing business. Stocks to Watch No. 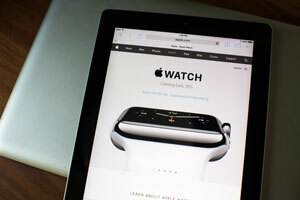 1, AAPL: Tech giant Apple Inc. (Nasdaq: AAPL) rattled investors when it announced last week that it anticipated delays in shipments of its new product, the Apple Watch. With orders beginning on Friday, many customers complained that it could take until June for them to obtain the gadget. The company is expected to release its pre-order numbers from this weekend on Monday morning. Slice Intelligence, a shopping analytics firm, predicts that U.S. Apple customers purchased roughly 1 million watches on Friday. Stocks to Watch No. 2, GOOG: Online search giant Google Inc. (Nasdaq: GOOG, GOOGL) is under stress on news that European antitrust regulators are considering charges against the firm. According to reports, Google has been suspected of preventing smaller competitors from bringing their products to the market. The company maintains 90% of the online search market in Europe. The fine for violating antitrust laws in Europe could reach $6.4 billion. Stocks to Watch, Earnings Roundup: Investors can expect earnings reports today from Commerce Bancshares Inc. (Nasdaq: CBSH), Pep Boys (NYSE: PBY), Kinder Morgan Inc. (NYSE: KMI), and Bank of The Ozarks Inc. (Nasdaq: OZRK).